The Raspberry PI is a miniature low cost computer that can be used for a wide range of projects and entertainment. You may have seen a lot of press around the Raspberry PI as it has had quite a lot of exposure. It’s a great way to learn Linux computing and to dive into the world of programming – There are many resources available online such as YouTube and the Raspberry Pi Forums. The first thing you’ll notice is that the RasPi comes with no case, it is a circuit board with components on, this may come as a shock if you’re used to just going out and buying a computer. Many cases of different shapes and sizes are available online, most likely from the retailer you purchased the RasPi from. No keyboard, mouse or wireless access is provided unless you’re buying a kit that includes these items. There are 2 USB ports (Model B) on the board which you can use, or you can use a powered USB hub if you need more ports. There is no on/off switch as soon as you plug in power it will attempt to boot. You will however need an SD Card (not provided) with an operating system already set up. There are various Linux distributions available for download from the Raspberry Pi website – as well as community developed projects such as XBMC, OpenElec for media servers. Many popular and well-known distributions are available. some of which outlined below. These are just a taste of what is available. Check out the Raspberry Pi website for more information. The list is endless really, you can’t eat it – but the Raspberry Pi provides GPIO access for interfacing with other hardware, it can be used for learning electronics or connecting additional third-party modules. There is also an SPI interface for connecting things such as the official RasPi Camera Module. It’s basically a Linux computer and most if not all things you can do with a regular Linux computer you can do on the Raspberry Pi. It’s convenient to just plug in to the TV or monitor and have instant access to a system, the best part is if you do manage to break the operating system it only takes minutes to fix, as the OS is stored on an external card. 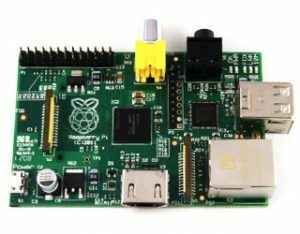 If you’re into computers or just want to learn how they work then a Raspberry Pi is for you. It’s a great educational tool for learning and for the price they cost it’s worth having a look and trying it out. Check out the Raspberry Pi website for more information and where to buy.